Here! Here! I'll drink to that. Situated in Great Victoria Street, Belfast, The Crown Bar & Liquor Saloon, is a marvellous example of a Victorian "gin palace," and certainly my favourite supping spot in Ireland. Following a media campaign by the late English Poet Laureate, Sir John Betjeman, the property was bought and saved for preservation by the National Trust in 1978. At a cost of 400,000 pounds, it has been lovingly and faithfully restored to its former splendour. The Crown is now an exquisite masterpiece in bar architecture, with superb atmosphere and great "craic." Built in 1826, and formerly known as the Railway Hotel, it was not until the 1880s, under the ownership of Michael Flanagan, that the transformation from relative squalor to refined splendour took place. Incongruous as it might seem, the conversion was stimulated by the construction of numerous Roman Catholic chapels around the city. Many of the Italian craftsmen engaged in Belfast's ecclesiastical buildings supplemented their income with a little moonlighting, and The Crown was a prime beneficiary of their "after hours" skills. Mosaic tiling, gilded and etched glass, inlaid woodwork, brocaded walls, ornate mirrors, Lyncrusra papered ceiling, stained glass windows, gleaming brasswork - all enhanced by a variety of decorative techniques in an array of exuberant colours. Each time I visit, I discover some previously unnoticed architectural or exquisite decorative detail. The long balmoral red granite-topped bar is a great place to sup a leisurely pint, chat to friends, make new acquaintances or just listen to the barman's banter. My last visit coincided with a "brass monkey" burst of weather, so I was especially grateful for the heated footrest along the front of the bar. To further assist in any "warming up" process are the vast array of Irish whiskeys, from both Northern Ireland and the Irish Republic, which are on offer. If the customer is awfully brave and speaks in a whisper, Scotch will even be served too! When I'm dining (and drinking) at The Crown however, I prefer one of the bar's ten snugs. A bit like confessional boxes, they were originally built to accommodate those shy (or sly) drinkers who wanted to slip in for "a quick one" (or two), on the quiet. The snugs each have their own door, upholstered seats, round a marble-topped table and a strategically placed gunmetal plate for striking matches. Just activate the antique bell system and alert the waiter to your needs. What a great place for an evening meal, with the gas lamps glimmering on the seemingly jewelled surfaces, producing a warm soporific whiskey-coloured glow. I find there's nothing like tucking in to a tasty plate of Irish champ (mashed potatoes) and gammon (ham), or coaxing down a few fresh Strangford oysters with a creamy-headed pint in one of The Crown's snugs. Only two buildings on this part of Great Victoria Street (Belfast's Golden Mile) have retained their original 19th century streetscape frontage. The Crown, with its polychromatic tiled exterior, is one; the nearby Grand Opera House the other. 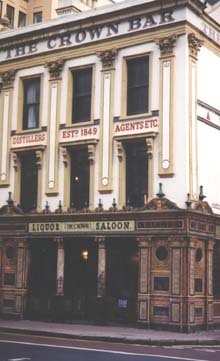 Because of their proximity, The Crown served as the local "watering-hole" for many of the Opera House performers. Autographed photos of entertainers such as, Roy Hudd, Cliff Richard, Frankie Howard and many more, are displayed adjacent to huge casks of spirit behind the ample main bar. When in town, John Thaw (TVs Inspector Morse) liked to drop in for a pint and a chat. Last time I visited, members of the Australian rugby team were obviously enjoying replacing the fluid they had lost while playing against Ulster at the nearby Ravenhill rugby ground. A deeply satisfying place for a drink and a meal, The Crown remains a popular meeting and mingling place for both locals and tourists. It is just one of the many traditional friendly pubs which have been the cornerstones of Belfast social life for centuries. The Crown Bar is only one of 12 hostelries on the historic pub tour of Belfast. Other famous bars include Whites Tavern, founded in 1630, The Kitchen Bar, noted for its traditional music sessions, The Duke of York, with its historic wooden snugs, Bittles Bar, decorated with portraits of Ireland's most celebrated literary figures, and the Morning Star — winner of the British Airways award for "best pub food."